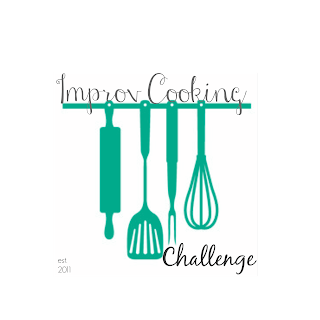 I’ll admit, I was a little stumped as to what to make for this Improv Cooking Challenge. The first image that came to my mind when I thought about sausage and mustard as ingredients is slicing up some cold homemade kielbasa and dipping it into good old French’s mustard. Now while that is delicious and I highly recommend it, it’s not a recipe. I debated on doing something slightly more creative like crumbling up the sausage and serving it over spaghetti squash with spinach and a mustard sauce or maybe stuffing a sweet potato with sausage, kale and honey mustard sauce, but in the end a classic Irish recipe that I’d never made before is what won out. Yep, that’s right. 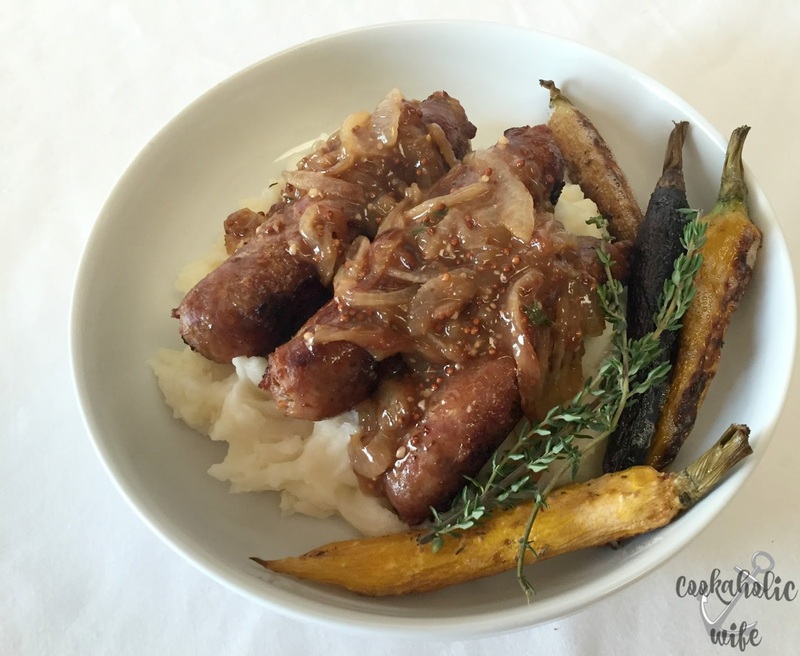 I’d never made, nor had, bangers and mash before a few weeks ago when I made this recipe. As I’ve mentioned numerous times, I was not an adventurous eater as a child and even the name “Bangers and Mash” was not at all appealing to my picky palate. Then there was the time frame as an adult where my eating grew more adventurous but I didn’t like sausage. Which brings us to now, as I scoff at my previous self for not wanting to try this delicious dish! The great Irish recipe of bangers and mashed served with an onion-mustard gravy. 1. Preheat the oven to 350 degrees. Line a baking sheet with foil. 2. Add potatoes to a large pot and fill with cold water. Season liberally with salt and bring to a boil over medium-high heat. Cook for 15-20 minutes or until the potatoes are fork tender. 3. Meanwhile, add the butter and onions to a small saucepan over medium-low heat. Cook for 20 minutes, stirring occasionally, until the onions have caramelized. 4. Add the olive oil to a skillet over medium-high heat and once hot, cook the sausages for 5-7 minutes or until brown on all sides. Transfer to the prepared baking sheet and finish cooking in the oven while you finish the rest of the meal. 5. Add the garlic and thyme to the caramelized onions and cook for 1-2 minutes. Add the beer to the saucepan and stir with a wooden spoon, dislodging any of the stuck bits of onion. 6. Stir in the mustard and once combined, sift the cornstarch over the mixture and whisk in the beef broth, stirring occasionally until the mixture reduces and thickens. 7. Meanwhile, drain the potatoes and add the milk, horseradish, salt and pepper. Mash the potatoes until smooth. 8. Plate the potatoes, followed by 2 of the sausages and a heaping spoonful of the onion-mustard gravy on top. This was AMAZING. It was the perfect amount of comfort food and deliciousness that you just crave sometimes. And the onion-mustard sauce? Yeah, Tom didn’t like it so I may have ate the rest of it with a spoon. Don’t judge. You could even make this recipe a lot quicker by picking up some of the prepared potatoes you can find in the refrigerated section of the store now. This recipe is totally going to become a staple during those cold winter months where the comfort food cravings are significantly intensified. 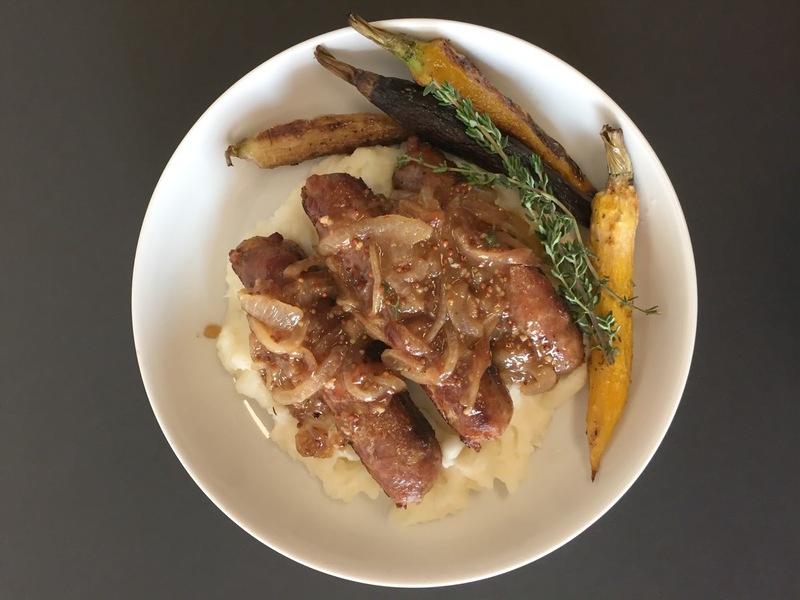 I have never had bangers and mash before either Nichole. Now that I know what they are I am sure to rectify that. Ooooooooooh Nichole! That Onion-Mustard gravy looks to die for! Thanks for hostessing another great challenge. Love bangers and mash. And I love the addition of mustard here. Okay, maybe mine's not a real sausage-mustard recipe. Whoops. They're on the same plate though!